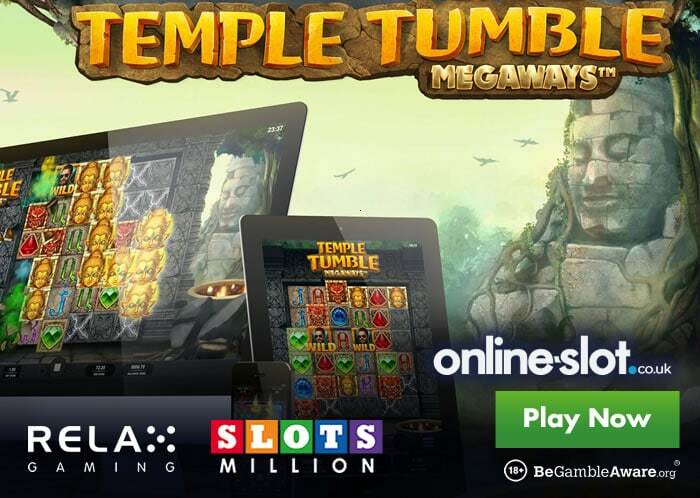 Relax Gaming has today released Temple Tumble MegaWays – this volatile new offering using Big Time Gaming’s MegaWays engine and takes you on an epic adventure where you hunt for treasure in the lost ruins of the Aztec Empire. Temple Tumble MegaWays is played on a 6×6 grid and offers up to 46,656 ways to win – playable from just 20p per spin across desktop, mobile and tablet devices, it looks fantastic and uses a cascading mechanic where winning symbols are destroyed with new symbols dropping in to give you another chance to win. If you clear all symbols from the grid, you will enter the Free Spins feature where you’ll begin with 6 free spins – you then choose 1 of 3 modes each offering a different level of variance. The Extra Spins option sees blocks giving you up to 3 free spins each time whilst the Multipliers option gives you multipliers up to 3x when stone blocks land. You can play Temple Tumble MegaWays at many online casinos – I recommend SlotsMillion Casino who are known for their excellent customer support, great range of slots (nearly 1,700) and same-day cashouts without fees and including weekends. Sign up and deposit to get a 100% match bonus up to £100 plus 20 extra spins per day for 5 days across various NetEnt slots (that’s 100 extra spins in total).